Nut bars cut into triangles are a popular treat in Germany. They can be found at many bakeries, but they are also easy to make at home. Veganising them is quite easy. Most vegan recipes are adaptions from the traditional recipe: they call for soy flour or egg-replacer instead of an egg in the shortbread crust. Margarine substitutes both the butter in the crust and the filling. I admit that I used to be a butter person and I never became close friends with vegan margarine, no matter what brand. I did use it for baking because it was easy, but a couple of years ago when people started to talk about all the issues with palm oil, often a part of margarine, I decided to no longer use margarine in my baking recipes. For many recipes refined coconut oil is a great replacement both for butter and margarine. You just have to keep in mind that coconut oil is 100 % fat and margarine (or butter) has a water content of about 20 %. If you use refined coconut oil instead of margarine in a recipe, always use a little less coconut oil. 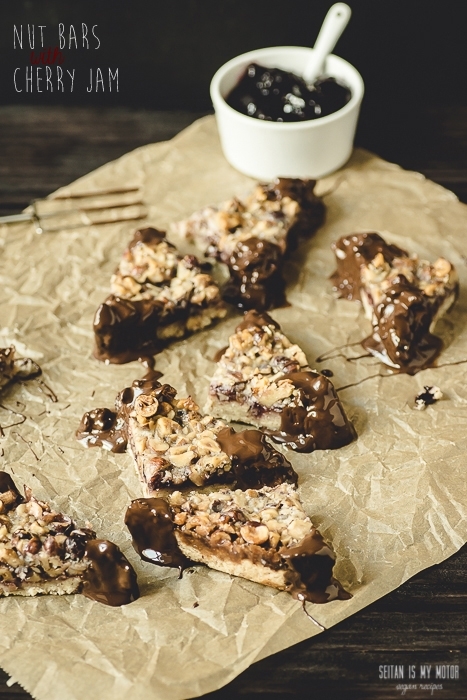 Sometimes things are more complicated though as this recipe for margarine-free nut bars shows. I already had a triangle nut bar recipe on my blog, a veganised version of a Dr. Oetker recipe, which, of course, called for margarine. If you make nut bars with margarine instead of butter, it’s easy to take those traditional recipes and veganise them. But what if you don’t want to use margarine? And what if you don’t want to grind your nuts but use coarsely chopped ones instead? Well, in this case using coconut oil for the topping is not always a good idea. I tried several different ratios of coconut oil to sugar and always ended up with gritty bars. (Yes, last week we ate a lot of nut bars!) Then I thought about making a caramel sauce for the topping and looked at recipes for caramel sauce. Those are often made with butter, too. But also with heavy cream. That sounded like a good start. Because there is a great vegan substitute for heavy cream. I am talking about coconut cream, which is the fat you can scrape off a can of chilled coconut milk. When I first tried this I used too much coconut cream and my topping came out rather pale and didn’t set the way it was supposed to. I also had spread a layer of cherry jam on the crust and the combination of jam and moist topping made these quite gooey. Delicious, but still not good enough. After all these nut bar trials I was fed up with chopping nuts. So for the next round I dumped all of them into my high speed blender et voilà, thanks to my lack of patience I ended up with 3/4 nut meal and 1/4 whole nuts in seconds. But you know what? I am done with making and eating nut bars. I now have a fantastic recipe even though this is still not like the one that is rattling around in my brain. Hey brain, do I have to say more than caramelised nuts and thick and still tender shortbread crust? No? Thank you! To make the crust: Cream together coconut oil and sugar. Add remaining ingredients and mix until crumbs form. Line a 20 x 20 cm (8 x 8 inch) baking dish with parchment paper. Evenly press the dough into the pan and set aside. To make the topping: Combine sugar and water in a small saucepan and heat gently. Stir until the sugar is dissolved. Bring to a boil on high for 5 minutes. (See picture above.) 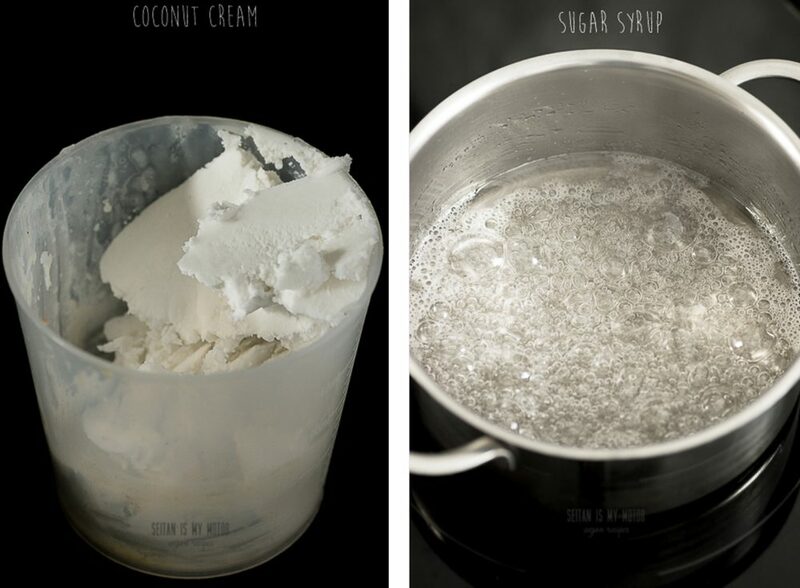 Remove from heat and stir in coconut cream, salt, and vanilla. Mix everything until the coconut cream is dissolved. Add nuts and stir until everything is combined and no lumps are left. 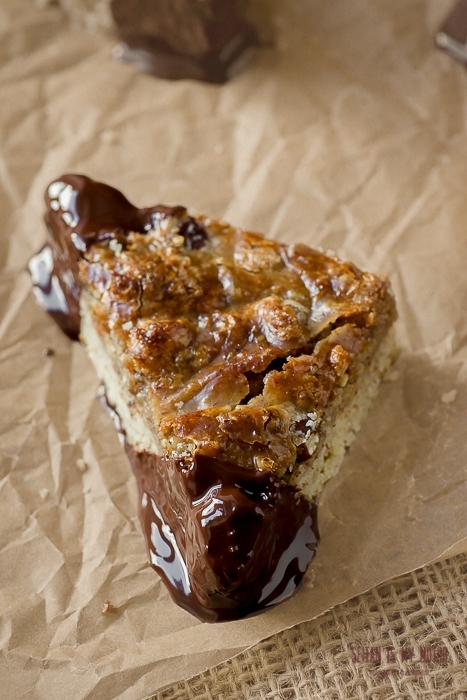 Spread on top of the crust and bake for 25-30 minutes, or until the topping is golden brown. Remove from oven and let cool completely before removing from pan. Please note that these are moist and delicate, so make sure to cut them carefully with a sharp knife. Cut into four squares and then cut those into two large or four small triangles each. Melt 200 g (7 oz) chocolate and 1 teaspoon vegetable oil in a water bath. Place the nut bars on a piece of parchment paper or on a cookie rack placed over a piece of parchment. 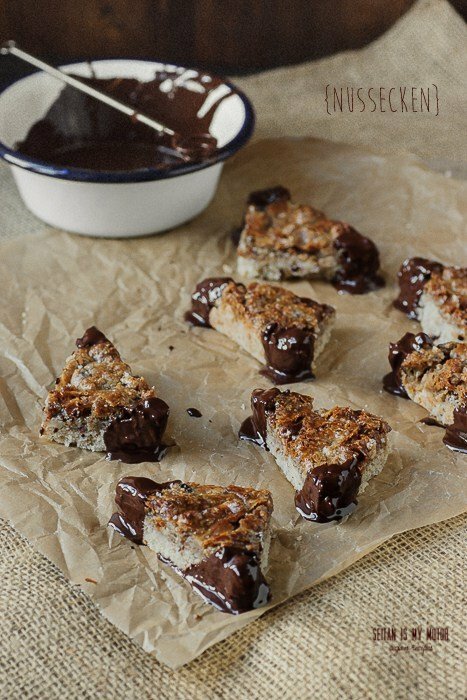 Dip the edges into the chocolate or, if the bars are a bit too crumbly, use a spoon to cover the edges with chocolate and let dry. Store these in an airtight container at room temperature. They should keep for 3-4 days. Die sehen echt super lecker aus! Werde ich heuer 100pro machen, als Adventsgeschenk für die Familie. Ich finde super, dass du auf Margarine hier verzichtest. Außerdem war ich begeistert, wie schnell sie gemacht sind – echt easy! Und der Teig war roh schon ein Traum. Vielen Dank für dieses leckere easypeasy-Rezept! Once again, you have opened up my world to something new and delightful. The last photo is absolute perfection. I could eat a million of these! I’ve been flirting with the idea of trying coconut oil in place of my beloved Earth Balance in a few recipes. Just to see whats up. I wouldn’t have even thought about the difference in water content so I’m glad you brought that up! I’ve been making these for a couple of years, and they’re wonderful. I know and those are fantastic recipes. But I’m afraid I am too lazy.